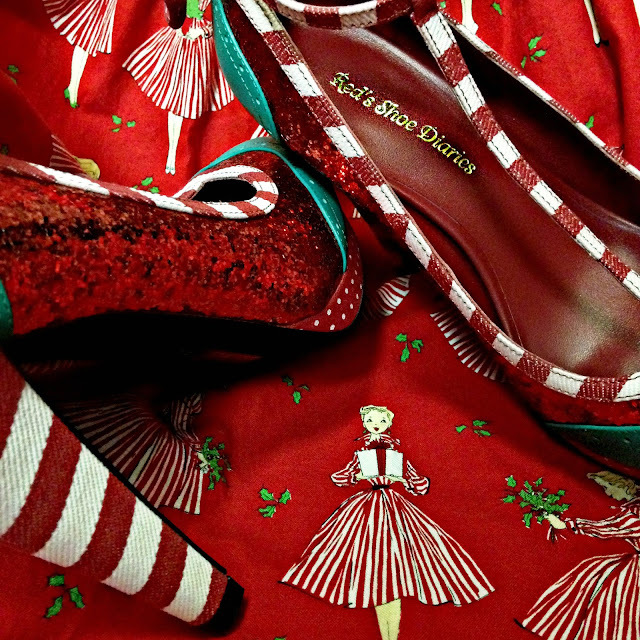 This admittedly (slightly) over the top holiday look is signature Red's Shoe Diaries: the 1950s style dress was custom made for me by Four Eyed Girl using a fantastic Alexander Henry fabric I discovered last summer (and which Modcloth subsequently used a few months later in its own holiday dress design - guess I was ahead of the style curve on that one); I designed the one of a kind spectator heels by Shoes of Prey (best shoe lover site ever! 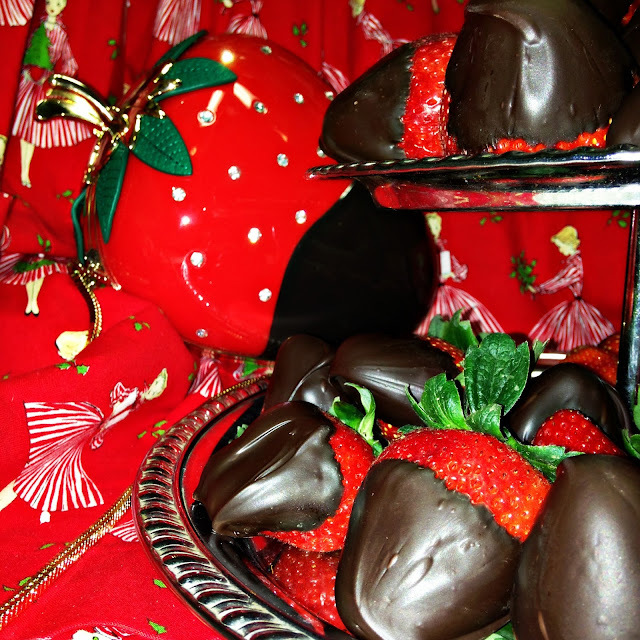 ); the chocolate covered strawberry purse from Kate Spade was a must-have, because chocolate covered strawberries are a signature Red's Shoe Diaries dessert! Whenever I visit my grandmother Norma Jean at her nursing home, I'm always greeted warmly by a host of staff members and other residents. They know me on sight, and there a few who always stop me to talk about fashion and style. I'd like to say it's because I visit all the time, but the truth is I'm not able to make the 90 minute drive as often as I'd like. 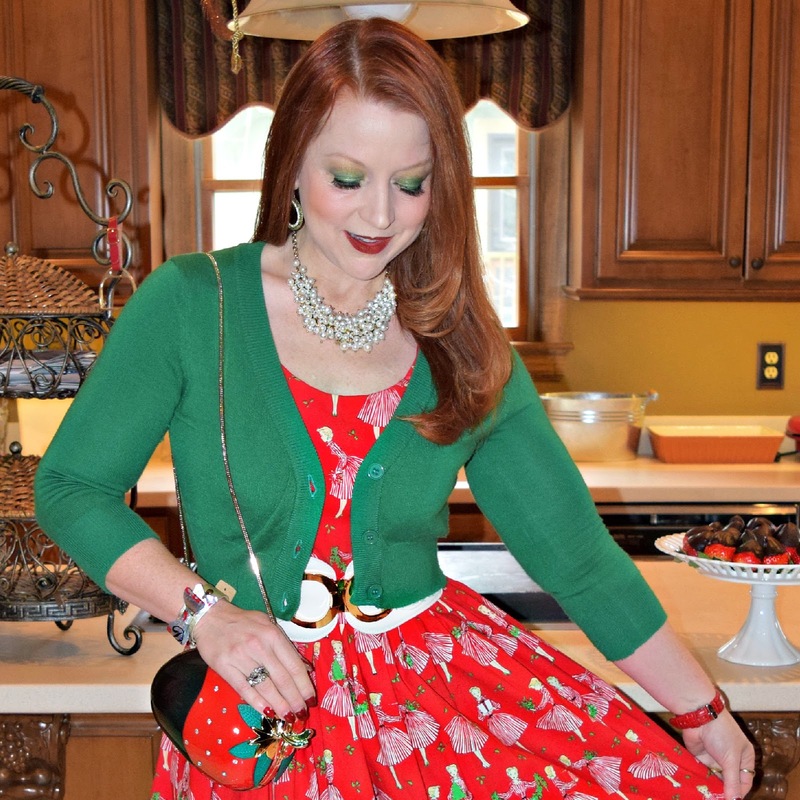 In reality, they recognize the vintage style and red locks because Norma Jean, the ever-proud grandma, is a fan of my signature retro dresses and quirky, colorful shoes, and always makes a point to introduce me to every passerby. 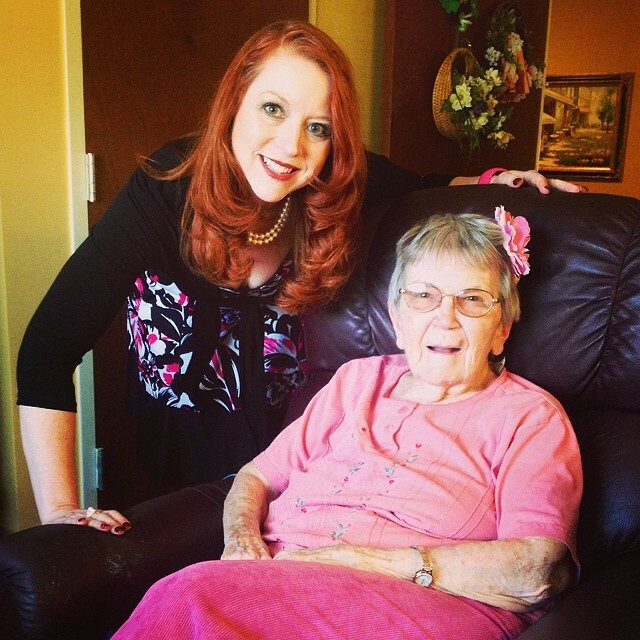 Norma Jean and me with her new and improved memory book. She's wearing her signature green color, always her favorite and, though you can't tell in this photo, even her fingernails were green and embellished with snowflake designs for the holidays. She also regularly carries a book I made for her that includes a reprint of a previous blog post about our relationship along with several pictures of the two of us through the years. I'm relatively certain every staff member that crosses her path has had to endure that book at least twice, which further explains why nurses and aides I've never met know I'm Norma Jean's granddaughter the second I walk in the door (and I extend to them my gratitude for their kind and patient treatment of Grandma through all her ups and downs and repeated stories). In fact, she's carried the book around and looked at is so often in the past year that two of the pages came loose. She reluctantly gave it up when I visited at Thanksgiving, with the request that I "fix" the torn pages. I took it as an opportunity to add a few new memories, so when we were together last weekend for an extended family Christmas, I was able to surprise her with a brand new, and bigger, book. I love that Shoes of Prey allowed me to customize my own shoe design with a personalized foil stamp on the instep identifying them as unique to me. Her obvious delight at the gift brought me such joy, just as she herself has brought me such joy through the years. 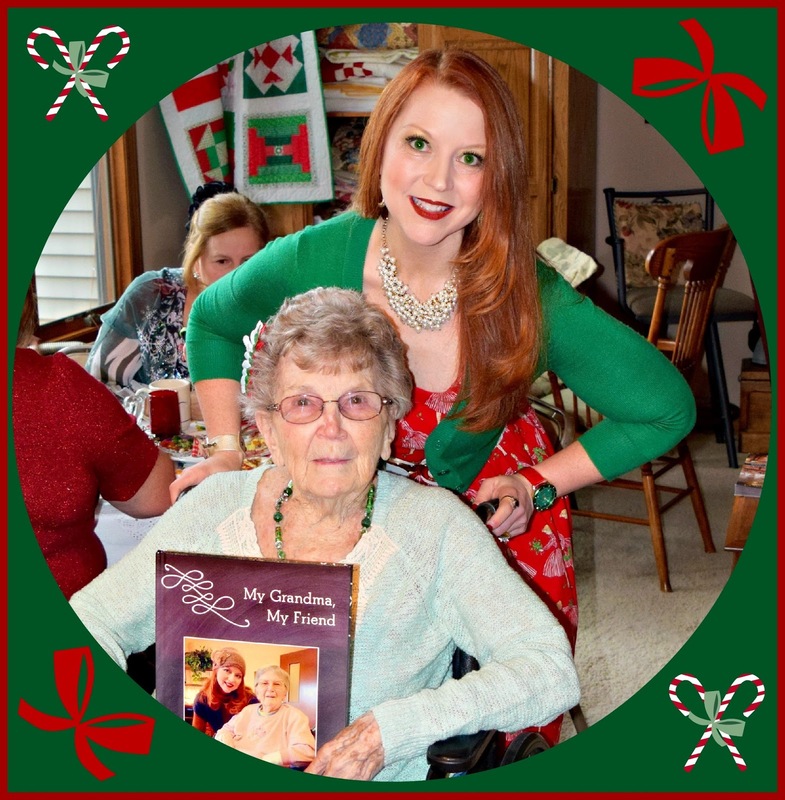 I feel so fortunate to have yet another holiday to celebrate with Norma Jean, and I know that even when the day comes that she's no longer with us, her spirit will live on as will the memories captured in her book. 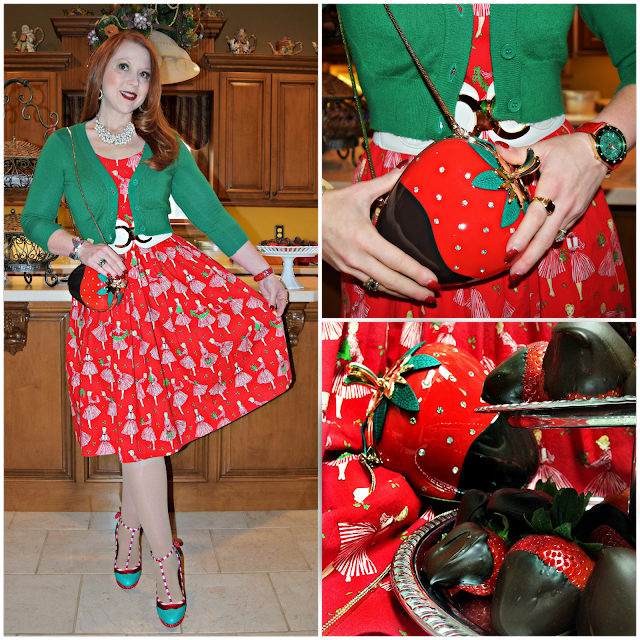 Wow what a perfect Christmas-y otufit! You look so darn cute! That purse is perfection with the outfit. That's really sweet that you made your grandmother that book, and that she talks about you so much. You sound like a great granddaughter! Thanks, Bristol! I need some of those darling Christmas ornaments you have ;) I do have a chocolate covered strawberry ornament, though.